The Girl in this picture has solved a problem. She has just completed a perfect make-up job on her bare legs. If she watches her step, keeps out of dirt and puddles, takes lukewarm showers ( but no baths ), these “liquid stockings in a bottle” she has smoothly spread over her legs from toe to thigh will last three days. Since 1940s stockings of both rayon and cotton, the only kind available this summer are both hot and sticky, and those deliciously soft nylons we had a brief encounter with before the war have all but vanished ( except it is said into the kit bags of GI’s overseas ! ), legs of all ages, shapes and sizes are succumbing to the artifice of makeup. Bare legs look indecent. Sun tanned legs are uneven in color. Liquid stockings seem to be the solution. While this years leg cosmetics are less inclined to smudge, streak, spot in the rain, or come off on clothes, spare a thought for our poor sisters in the UK and occupied France. over there, wartime restrictions leave them very little alternatives and everything from tea to Bisto is being used by desperate girls for that important night out. In applying leg make-up – or liquid stockings if you prefer, it is important to have well scrubbed, shaved and exfoliated legs to begin with. An odourless depilatory cream is even better. Remember to use clean, quick upward strokes. Its hard !. You can do it with an eye pencil. 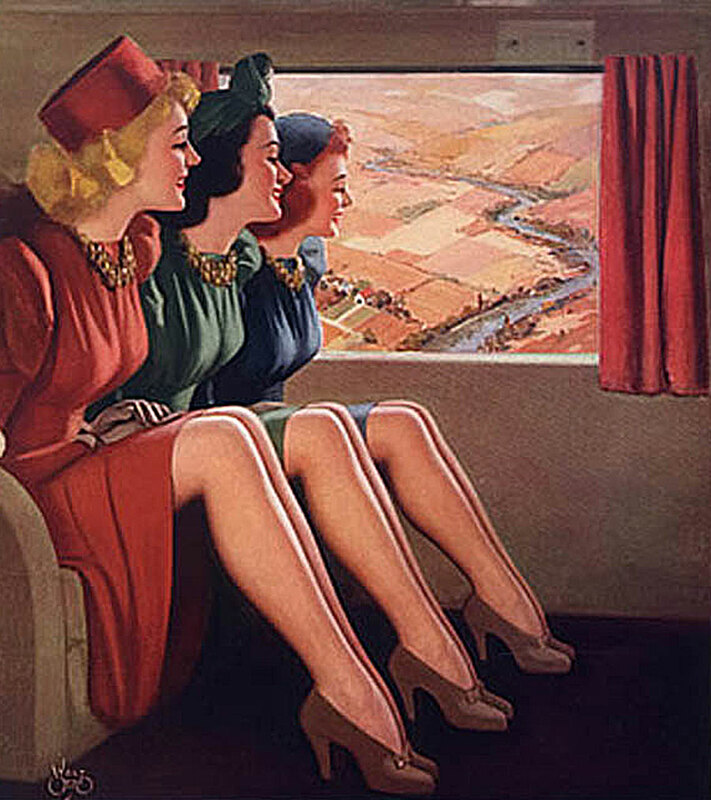 Painted seams are resorted to only by women who must completely fool their friends into thinking they are wearing stockings! Originally reported in Life magazine 1943.